The aye-aye is one of the most unusual primates in the world and is found on the northern east coast of Madagascar. It has large eyes, black hair, big bat-like ears, and a long bushy tail. Its coat is thick with a slate gray to brown coloration. Aye-ayes also have a layer of "guard" hair on their fur with white flecks and lighter tips. Their fingers are long and thin, and the third finger can grow up to three times longer than the others. The face is lighter in color than the rest of the body, and the eyes are yellowish-orange in color. Adults grow up to 16 inches long and a tail length of two feet, and they can weigh up to 4 lb. Aye-ayes prefer to live in habitats with forests, mangroves, and bamboo thickets, but many live in cultivated areas due to deforesting. 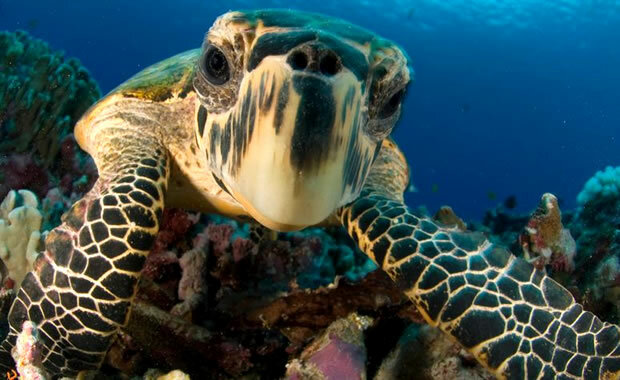 They are nocturnal and prefer to live alone except when foraging in groups. During the day, they sleep in nests that they build in large tall trees, and different nests are used on consecutive days by different individuals. The structure of the nests are very complex, and a new nest must be built every few days. The aye-aye is an omnivore and eats nuts, insect larvae, fruits, nectar, seeds, and fungi. Mating can occur year-round, and the female gives birth to a single young after a gestation period of 160 to 170 days. Like many other primates that dwell in the forests of Madagascar, this species is threatened by widespread deforestation due to agriculture and development. 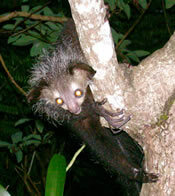 Also, some locals persecute the aye-aye because of its bizarre appearance. They are also treated as pests because they may feed on some plantation crops. Sixteen locations where the aye-aye can be found are protected, including the Ankarana Reserve, Ranomafana National Park, Andasibe-Mantadia National Park, and Nosy Mangabe Special Reserve. There is also a captive breeding program at the Duke Primate Center in North Carolina and other locations. Copyright Notice: This article is licensed under the GNU Free Documentation License. It uses material from the Wikipedia article "Aye-aye". Glenn, C. R. 2006. "Earth's Endangered Creatures - Aye-aye Facts" (Online). Accessed 4/23/2019 at http://earthsendangered.com/profile.asp?sp=16&ID=1.